Though FOX has cancelled Back to You, TVWeek is reporting the series may find new life on another network. 20th Century Fox TV produces the series and is trying to find it a new home. They’re reportedly delivered episodes of Back to You to CBS President and CEO, Leslie Moonves, to see if the network wants to take it on for season two. In early 2007, CBS and other networks were involved in a bidding war for Back to You. FOX eventually won out and gave the series a 13-episode commitment without having seen a pilot. In retrospect, that may have been a mistake as it took awhile for the sitcom to find its groove. The sitcom didn’t live up to ratings expectations and, coupled with production expenses, FOX cancelled the show. CBS has been interested in both Grammer and Heaton for some time. Heaton, of course, co-starred on the popular Everybody Loves Raymond for nine seasons. 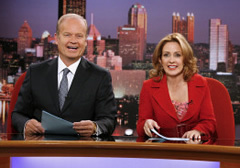 CBS Paramount Television tried to woo Grammer for a Frasier spin-off but it didn’t work out. If Back to You finds a new home on CBS, it will likely be part of an additional night of comedy programming. If CBS attempts another block of sitcoms, that will likely mean good news for not-yet-renewed shows like How I Met Your Mother, Rules of Engagement, and The New Adventures of Old Christine. Stay tuned! I wish ya’ll would keep this show!!! This was next to friends since its been off the air, one of the funniest new shows. Please reconsider. Thanks because we need more laughter in the world.